Election Tracker LIVE | The Congress entered into an alliance with the Apna Dal led by Krishna Patel in Uttar Pradesh and allocated two Lok Sabha seats — Basti and Pilibhit — for the party. Patel's son-in-law Pankaj Niranjan Singh Chandel joined the Congress in the presence of party president Rahul Gandhi and general secretaries Priyanka Gandhi Vadra and Jyotiraditya Scindia. 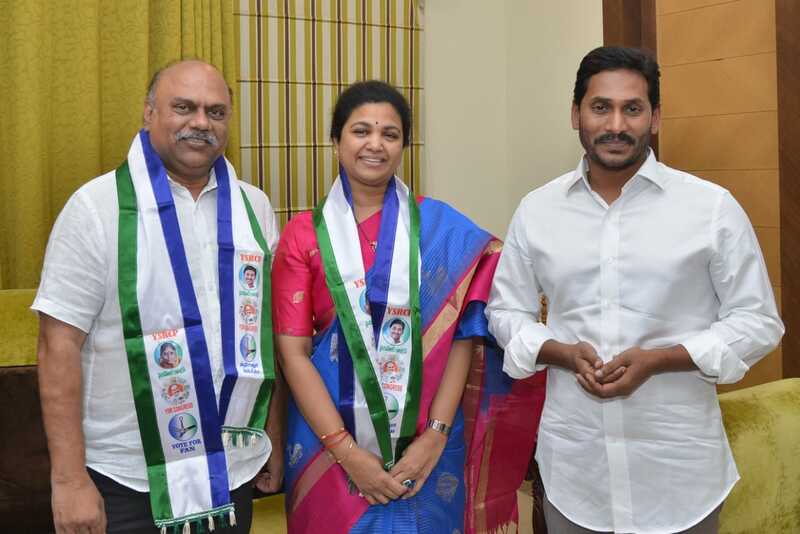 TDP MP from Kurnool Bhutta Renuka joins YSRCP in the presence of the party chief Jaganmohan Reddy. Earlier in the day, TDP MLC Adala Prabhakar Reddy who got confirmed MLA ticket from Nellore Rural assembly constituency joined in YSRCP. 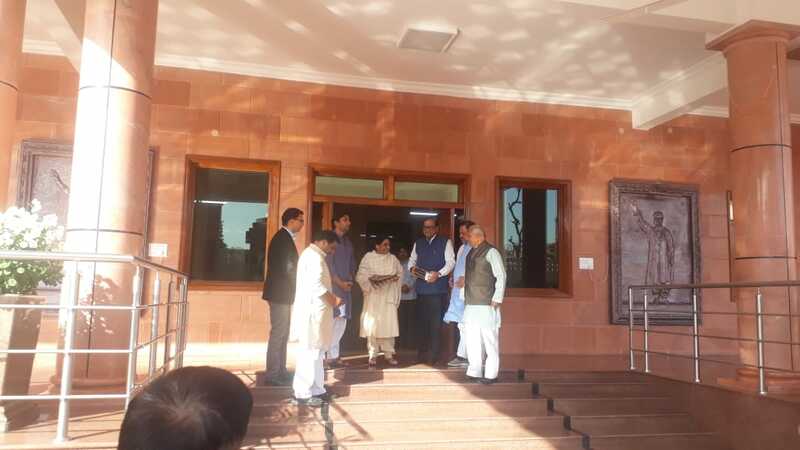 Prime Minister Narendra Modi arrives at BJP headquarters for the party's Central Election Committee (CEC) meeting. Asom Gana Parishad gets 3 of the 14 Lok Sabha seats and one of the two Rajya Sabha slots for which polls are due in June. However, both parties remain firm on their individual stand on Citizenship Bill. The decisions were taken at a formal meeting of the AGP leadership with Amit Shah in New Delhi. Himanta Biswa Sarma was also present in the meeting. 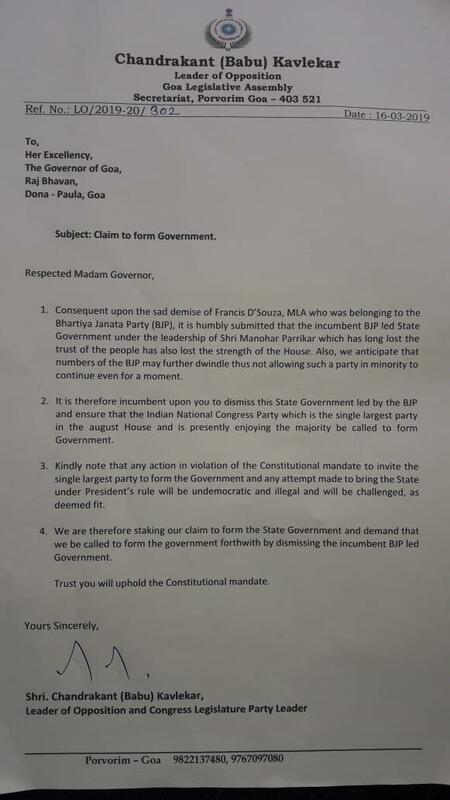 Congress stakes claim to form government in Goa; writes to Governor to dismiss BJP-led government which is in "minority" and call "single-largest party Congress to form govt." Also states in its letter, "any attempt to bring Goa under President's rule will be illegal & will be challenged." The strength of the assembly reduced from 40 to 37 after the death of former Deputy Chief Minister Francis D'Souza's death and the resignation of two MLAs — Subhash Shirodkar and Dayanand Sopte. YSRCP president Jaganmohan Reddy to release the party’s candidate list tomorrow at Idupulapaya. After Sikkim Krantikari Morcha, another BJP ally withdraws from alliance-Indigenous People’s Front of Tripura (IPFT) have decided to contest both Lok Sabha seats alone as BJP was supposedly reluctant to vacate the East Tripura seat (ST). This comes a week after Ram Madhav announced of a grand alliance in place in Northeast. KL Chishi to contest as Congress candidate from Nagaland Parliamentary Constituency in the Lok Sabha Elections and Alemjongshi Longkumar as Congress candidate for by-election to the Nagaland Legislative Assembly from 26 Aonglenden (ST) Assembly Constituency. Rahul Gandhi’s Chennai Event Lands in Trouble | Acting on a complaint given by BJP youth wing, the Election Commission has asked the Chennai district officer for a report on Stella Maris college giving permission for Congress president’s political event. Just yesterday the directorate of collegiate education had also issued a circular to the regional director seeking explanation as to how the campus was used for political event at a time when model code of conduct was in place. 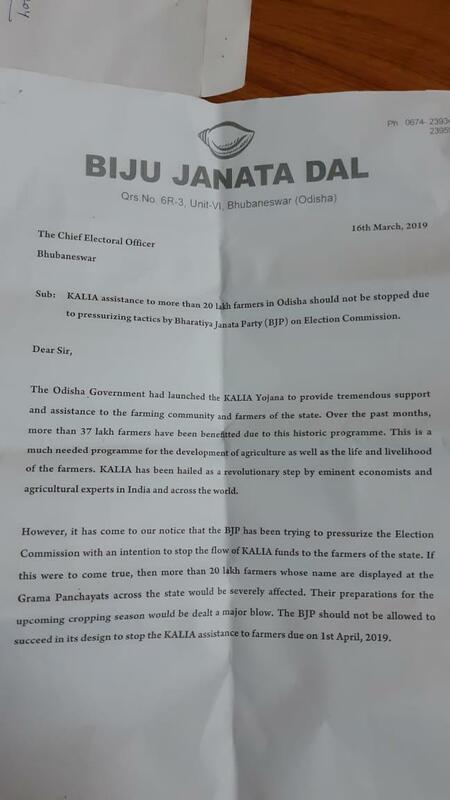 Biju Janata Dal writes to State Chief Electoral Officer stating that 'BJP has been pressurizing Election Commission to stop flow of KALIA assistance being provided to over 20 lakh farmers in Odisha. The party should not be allowed to stop it,' ANI reported. Shah Faesal to Launch Political Party Tomorrow | Former IAS officer Shah Faesal will launch his political outfit 'Jammu and Kashmir People's Movement' at a function in Rajbagh area of the city on Sunday. He said the function will be held at Gindun Ground in Rajbagh. The 2010 batch UPSC topper resigned from the IAS in January this year to protest unabated killings in Kashmir and maginalisation of Indian Muslims. Faesal had also hit out at the Centre, accusing it of subverting public institutions of Reserve Bank of India, Central Bureau of Investigation and the National Investigation Agency. Communist Party of India (Marxist) releases the list of 45 candidates for the Lok Sabha Elections. Congress President Rahul Gandhi outside the residence of CRPF ASI Mohan Lal who lost his life in the terrorist attack on CRPF convoy in Pulwama on February 14. The Congress President met the family of the deceased ASI, news agency ANI reported. TDP MLC Prabhakar Reddy Joins YSRCP | TDP MLC Adala Prabhakar Reddy who got confirmed MLA ticket from Nellore Rural assembly constituency has joined in YSRCP. He is likely to contest for Nellore parliamentary seat. Mekapati Rajamohan Reddy represented in Nellore constituency 2014. Now YSRCP thinking to replace Mekapati Rajamohan Reddy with Adala Prabhakar Reddy. There will be no elections after 'Modi tsunami' in 2019: Sakshi Maharaj | BJP MP Sakshi Maharaj has said that the upcoming Lok Sabha polls will be fought in the name of the country and there will be no elections after that. "The Modi tsunami has awakened the country. I feel there will be no election in 2024... this is the only election and we are fighting it in the name of the country with full honesty," Maharaj said during a party programme. 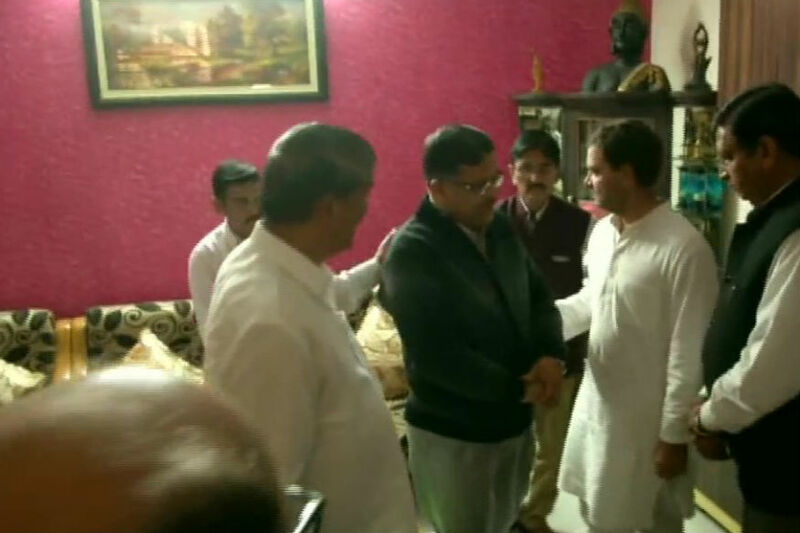 After addressing poll rally in Dehradun, Congress president Rahul Gandhi met the family of Major Chitresh Singh Bisht at the latter's residence in Dehradun. Major Chitresh Singh Bisht lost his life on 16 February while defusing an IED which was planted by terrorists across the LoC in Rajouri district, J&K. Shiv Sena has declared that its Goa state unit chief Jitesh Kamat will contest the elections from North Goa while vice president of the state unit, Rakhi Prabhudesai Naik will fight from South Goa. The announcement was maid by senior Sena leader Sanjay Raut. Days after BJP inducted former Biju Janata Dal MP Baijayant Panda, Balabhadra Majhi, BJD MP from Odisha’s Nabarangpur Balabhadra Majhi switched sides and joined BJP on Saturday. Majhi was welcomed by Union minister Dharmendra Pradhan, Jual Oram and Panda. BJP, PM Modi trying to rake up old issues to divert public attention from failures, alleges Mayawati | BSP president Mayawati on Saturday accused the BJP and Prime Minister Narendra Modi of trying to rake up old issues to divert people's attention from their failures ahead of the upcoming Lok Sabha elections. "In order to divert people's attention from the failures of its government and prevent poverty and unemployment for becoming real election issues, BJP and Prime Minister Modi are trying to rake up all kind of dead issues," Mayawati said in a tweet in Hindi. "This is most condemnable... people should remain cautious," she added. In another tweet, she alleged that the Prime Minister mostly remained busy in laying foundation stones and spent Rs 3,044 crore in publicity. 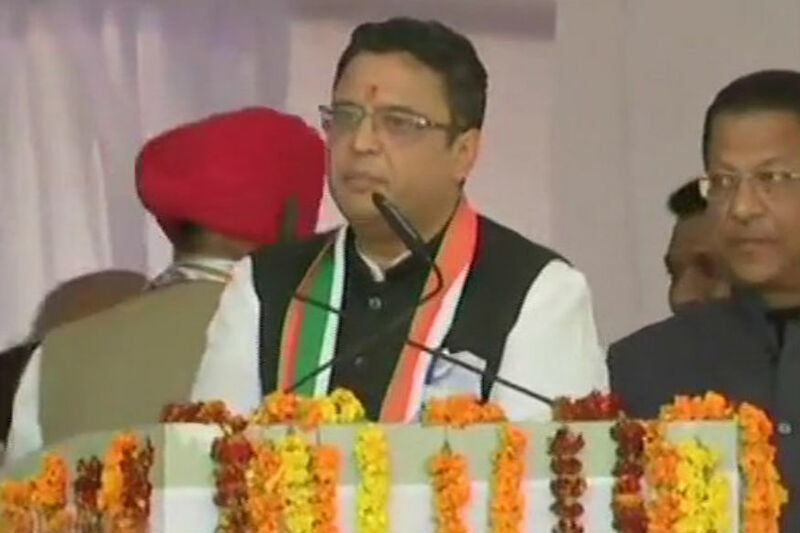 While welcoming Manish Khanduri, the son of former chief minister of Uttarakhand BC Khanduri, in Congress, Rahul Gandhi alleged that senior Khanduri gave all his life to the Army but when he questioned the government on national security, he was removed from the chairmanship of the parliamentary committee on defence. TRS president KCR to kick off LS poll campaign from Karimnagar | TRS president and Telangana chief minister K Chandrasekhar Rao will kick off his campaign for the Lok Sabha polls with a public meeting at Karimnagar on Sunday. Karimnagar has been a stronghold of the Telangana Rashtra Samithi (TRS) since the party's formation in 2001. Rao had represented Karimnagar in the Lok Sabha earlier. Rao, the star campaigner for TRS, will address election rallies at various places in the state beginning from Karimnagar, party sources said. In the season of political realignments, BJP MP Shyama Charan Gupta switches sides and joins Samajwadi Party. He will be contesting the Lok Sabha Elections from Banda constituency as a SP candidate. Patel's son-in-law Pankaj Niranjan Singh Chandel joins the Congress in the presence of party president Rahul Gandhi and general secretaries Priyanka Gandhi Vadra and Jyotiraditya Scindia. The Congress wrote to governor Mridula Sinha and staked claim to form the government in Goa. Leader of opposition in the assembly and Congress Legislature Party chief Chandrakant Kavlekar urged the governor to dismiss the BJP-led government, led by ailing Manohar Parrikar, in the state as it was in a minority now following the death of Mapusa MLA Francis D’Souza. Acting on a complaint lodged by the BJP youth wing, the Election Commission has asked the Chennai district officer for a report on Stella Maris college giving permission to Congress president Rahul Gandhi’s event. On Friday, the directorate of collegiate education had issued a circular to the regional director seeking explanation about how the campus was used for a political event at a time when the Model Code of Conduct was in place. 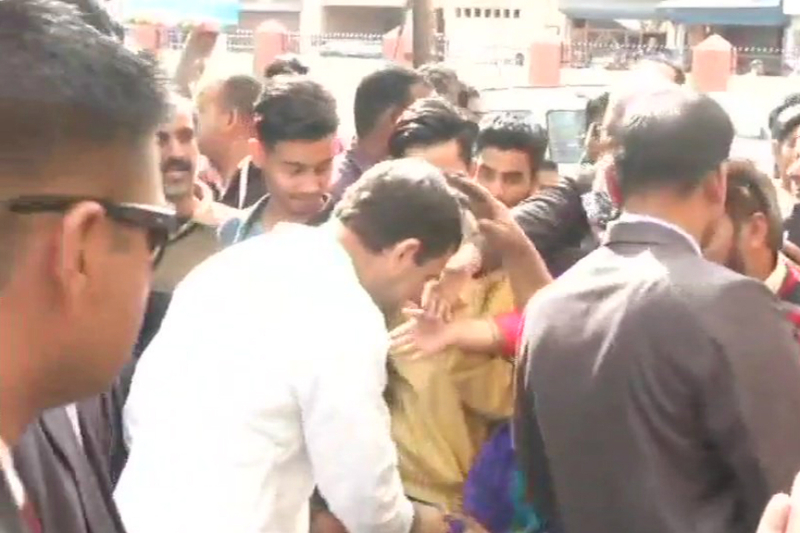 The Congress president, during his interaction with the college students here on March 13, promised 33 per cent reservation in government jobs for women and answered several of their questions. TDP MLC Adala Prabhakar Reddy who was recently confirmed as the Telugu Desam Party (TDP) candidate for the Nellore rural assembly seat, joined the YSR Congress Party (YSRCP) on Saturday. 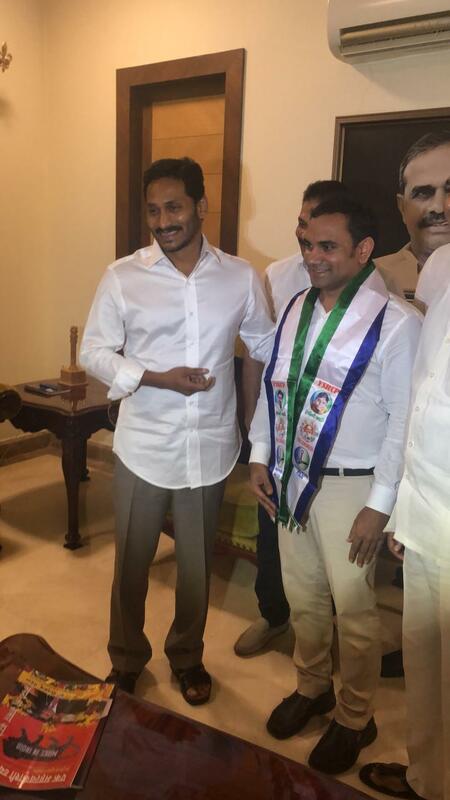 He is now likely to contest for the Nellore Lok Sabha seat on a YSRCP ticket. At present, the constituency is represented by YSRCP's Mekapati Rajamohan Reddy. Minutes after Janata Dal (Secular) general secretary Danish Ali joined the Bahujan Samaj Party (BSP), Uttarakhand CM and BJP leader BC Khanduri's son Manish joined Congress in the presence of party chief Rahul Gandhi. In the neighbouring state of UP, BJP MP Shyama Charan Gupta joined Samajwadi Party, and is said to contest general elections from Banda.